- You can simply use the Export function of your Outlook program on the Windows machine, and export your contacts in a CSV, or comma-separated value format. Now, a lot of Android apps, both free and paid, claim to be able to import from a CSV file, and that may indeed be so, but not with the format that current Outlook versions export them to - the fields often become all scrambled, duplicated or deleted altogether. - Gmail, however, has an excellent import tool for contacts exported in an Outlook CSV form, so just log into the Gmail account that is associated with your Android device, go to Contacts from the drop-down menu up left, and from the More tab above your contacts list, choose the Import function. - This will allow you to choose the CSV file you just got out of Outlook on your computer, and upload it to Gmail. Here they are - all your Outlook contacts synced with your new Android device, if you have chosen the option in the Contacts app on your handset to view your Gmail contacts list. Gmail even has a function to first merge your duplicates, and from the Contacts app on the phone you can transfer the pruned list to the SIM card as well, if needed. GO Contact Sync is what I use. Can automatically sync your contact changes between Gmail and Outlook. Great for me when paired with WorldCard Mobile business card scanner, automatically pulling the contact info to outlook. Yeah, like I really want Google to have access to my thousand-plus contacts, addresses, numbers and emails, not to mention my ten-year calendar. If a phone doesn't sync hard-wire without the cloud, i ain't buying.Cuts out all except Blackberry, Samsung and Apple. Your picture above clearly shows a DejaOffice Calendar. 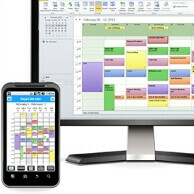 DejaOffice is by far the easiest and best way to use your Outlook Data on your iPhone or Android. DejaOffice supports Contact, Calendar, Task, Notes and Journal sync, shows the calendar with the correct colors (as in your photo above), and supports all your favorite Outlook featuresl like recurring tasks. With DejaOffice, you can transfer your data for free. You only need to pay if you want to sync (update the data) after two weeks. And after that, it's just $14.95. That's a lot better use of time than horsing around with CSV files and giving all your customer data to Google to use for marketing. I'm disappointed by this post. The writer confuses the need to transfer/export versus the need to sync. Seems we do need those "costly" syncing apps after all. Sigh. Thanks IvanOuro! It works like a charm - been frustrated in getting my contacts on my mobile after my organisation moved to a new server and introduced stringent rules for employees to access exchange server on their mobile devices, which I elected not to do. I also used iStonsoft Android assistant tool to export all data from my Samsung s5 to computer. In the process you use your Android phone, you will encounter a variety of problems,to solve these problems, you need a Android mobile phone Assistant: Android Transfer&Restore Tool.Thanks to iStonsoft Android Manager, which is an all-in-one Android transfer software and backup tool,with this Android assistant software,you can easy to manager your Android phone on Mac computer.iStonsoft Android Manager not only can help transfer messages&contacts in .xml format from computer to your Android device. To manage my android more effectively, I use the Vibosoft Android Mobile Manager to help me. It can backup everything to computer and manage apps as well! An excellent app which imports Outlook CSV files without having to juggle fields is: play.google.com/store/apps/details?id=eu.stargw.co​ntactsimport&hl=en This is a cheap app which requires no Internet access and keeps your contacts private. All of these are Contacts Only solutions. What about Calendar? What about next week, when your Calendar changes; is it going to double all your data? If you need the full set, Contacts, Calendar, Tasks, Memo, and Journal, CompanionLink is the best value synchronization tool by far. It has a number of options including USB and Wi-Fi sync, Cloud and Google options. They are really good at working with every model of phone and tablet, so you can use the same software with your next phone too. BTW - CompanionLink is what is pictured in the article above. Can someone help me? I have an ancient nokia, I have managed via OVI to migrate my contacts to outlook BUT it's only copied contact names not numbers!! What am I doing wrong? Hi friends, you can visit mobikin homepage to find a answer. Hope this helps! There are many different methods to transfer contacts from Outlook to Android. I've tried several of the tricks that shown in the previous answers. But I think they are not the simplest. I've tried Android Transfer and find it the simplest way that I've ever tried to transfer Outlook contacts to Android. I forgot the link to the tutorial. But only the domain of this site: transphone.net. If you are interested in it, you can google it. Export to CSV is the common way to move to another phone. It's nice. And this tutorial also tell you how to backup contacts to the Gmail is another method.